In art I’m equally interested for the aesthetic creations as much as for the attitude towards life of the creator. 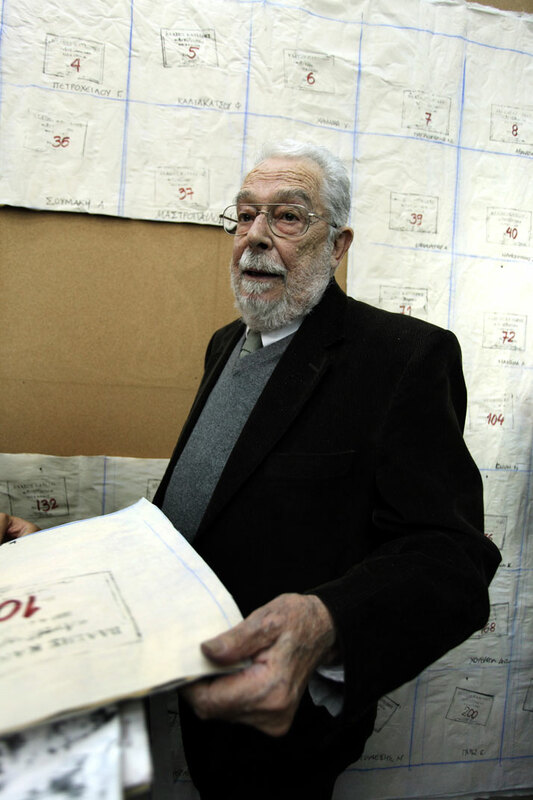 Vlassis Caniaris was a modern artist, politicized but never militized, who acted undisturbed for the past sixty years, from late modernism to the roots of postmodernism encompassing his exclusive morphoplastic material, the body of history and more specifically of modern Greek history, from the civil war of 1944-1949 till the dictatorship of 1967 - 1974 and the restitution of democracy to this day. His work was monoid but polyommatus, like that of mythical Argus, reconnoitering the sociopolitical scene inside and outside and taking a position on occurrence. Acting subsequently as great Art acted: comforting, but also revealing; poignant, but also construing. The distinctiveness of his aesthetic overture is in the details; overcome that, transforms a random object in morphological value that transfuses the paltry bits of precious, murmuring any personal history, any laugh or sob in the ears of eternity. From his first informelles configurations in 1956-1957 on newspapers or drippings on canvas, Caniaris did not describe, he put forward and proposed. At the age of 30, in 1958 he presented his first solo exhibition in Athens (Gallery "Zygos"), which is historically the first solo exhibition of abstract art ever exhibited in Greece. All his works were dedicated to the departed of an appalling accident that had taken place in the mines of Marcinelle – Belgium. The contradiction is that this exhibition was ‘hit’ by pure Marxist criticism as subjective and highly formalistic and praised by the "bourgeois" critics. Vlassis Caniaris, During ''Antidoro'' exhibition, November 2009. In 1959 in Naples and Bologna, and in 1960 a solo exhibition at gallery “La Tartaruga” of Rome, provides Caniaris the opportunity to convert the canvas to space and the image to the object. He takes works from the exhibition 'Walls' and dedicates them to ‘the Resistance Movement of Athens and the Civil War,’ in the untitled compositions, where the same material now apologizes for its nature and its content. The scholar of the artist, Michael Fehr, notes: "In the sixties (Caniaris) served in a very personal way the dissolution of the classical concept of the painting and developed his own particular language as a creator of objects.” Personally, I would add a lyrical user of those objects. And all this firmly within the broader research conducted by the European avant-garde from London to Rome and Paris to Berlin trying to articulate his own argument against the advancement of American Modernism: Nouveau Réalisme, L 'Art Autre, Arte Povera, Art and Language are opposing proposals towards versions of Pop and Conceptual Art's coming from the other side of the Atlantic. 1964 is a landmark year: Caniaris navigates to Venice Biennale like a battleship, representing the U.S., Robert Rauschenberg - firmly supported by a host of art critics. 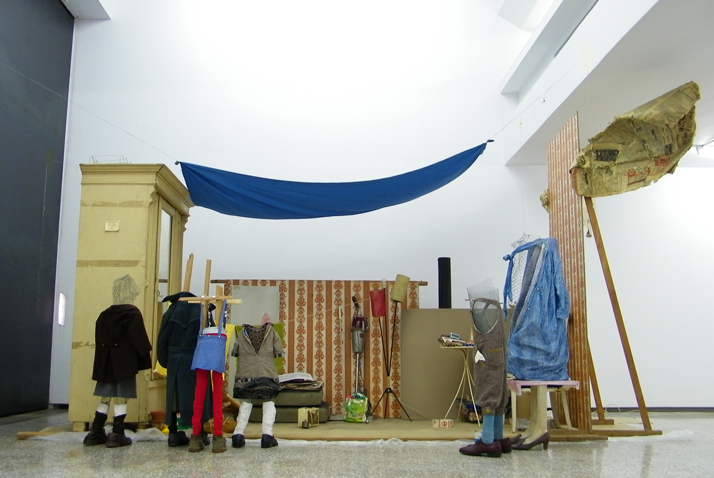 The first prize of the Biennale was the rational consequence. As a diversionary measure the independent critic and organizer of exhibitions Pierre Restany presents in the historic La Fenice Theater in Venice in July of that year, anti-exhibition "Proposals for New Greek Sculpting" participants were Daniel, Caniaris and Kessanlis. 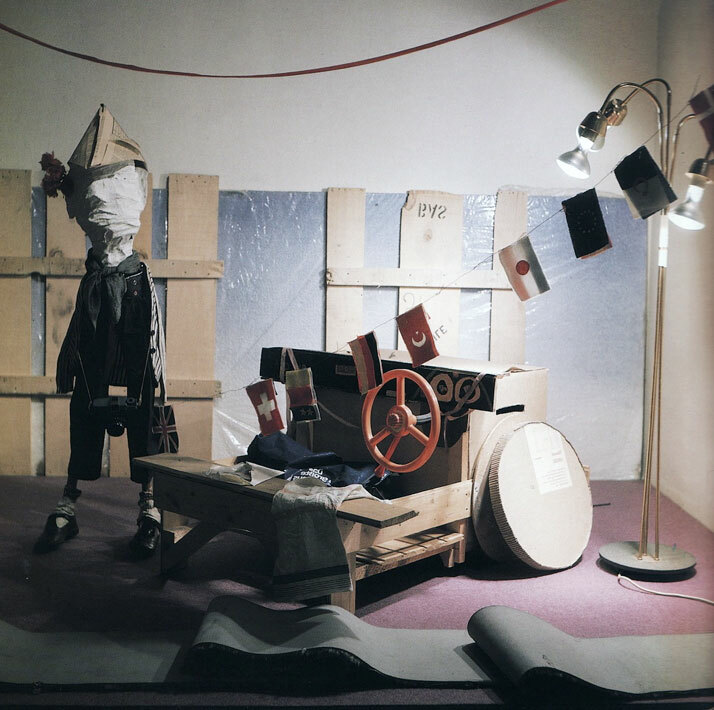 Cardboard boxes, sheets, ladders, or clothes in wire frames are the "works"; the result was theatrical and scenographical at the same time, as much as humorous and subversive, and has since been classified as disproportionately significant. Gradually, the artist sets up a human form, anticipating G. Heimonas when he writes in "Enemy of the Poet" that the human form does not exist in nature but is invented in painting. 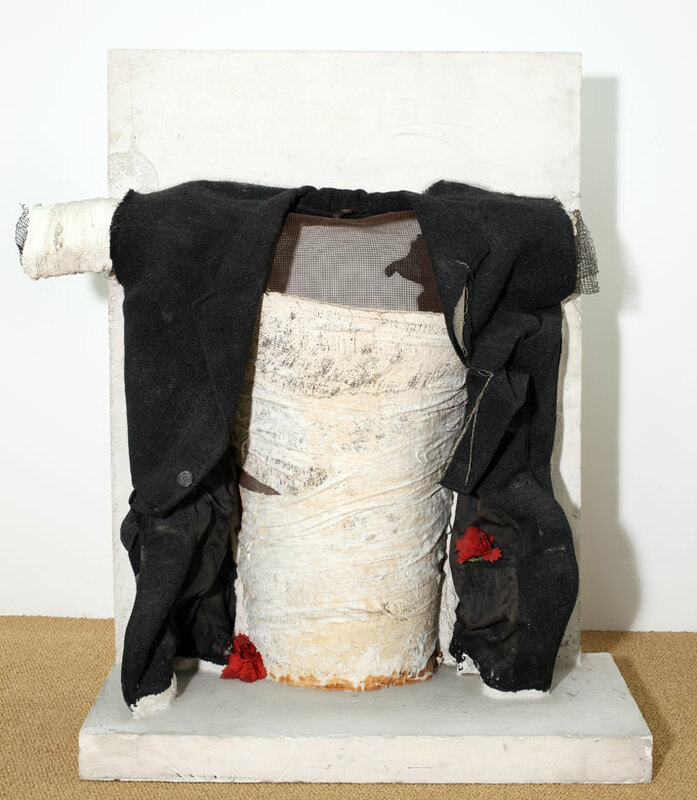 Vlassis Caniaris, Interrogation, 1969, plaster, wire, fabric, plastic, 110x60x50cm. His next big stop is the exhibition of 1969 in the “New Gallery” in Athens, while dictatorship is raging in Greece and is transferred to the Musée d'Art Moderne de la Ville de Paris in 1970. 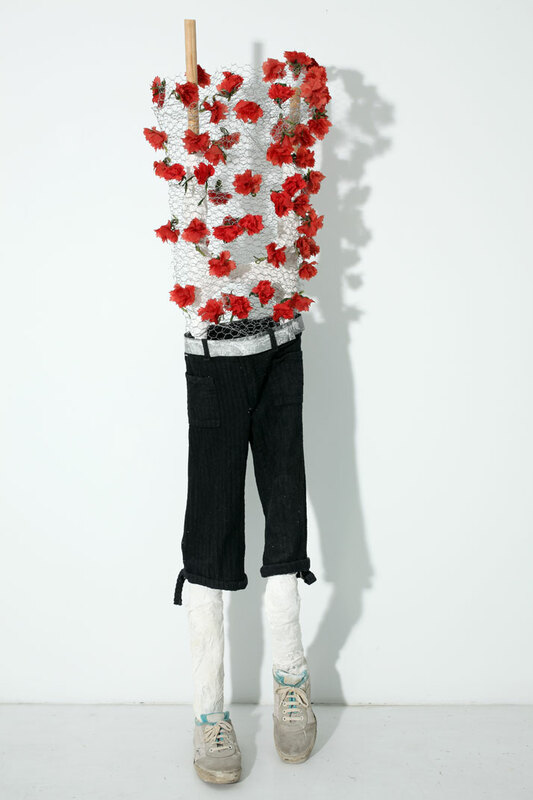 His works of 1964 seem almost prophetic; they engage gypsum with military belts, barbed wire with carnations and traces of feet with toy soldiers. 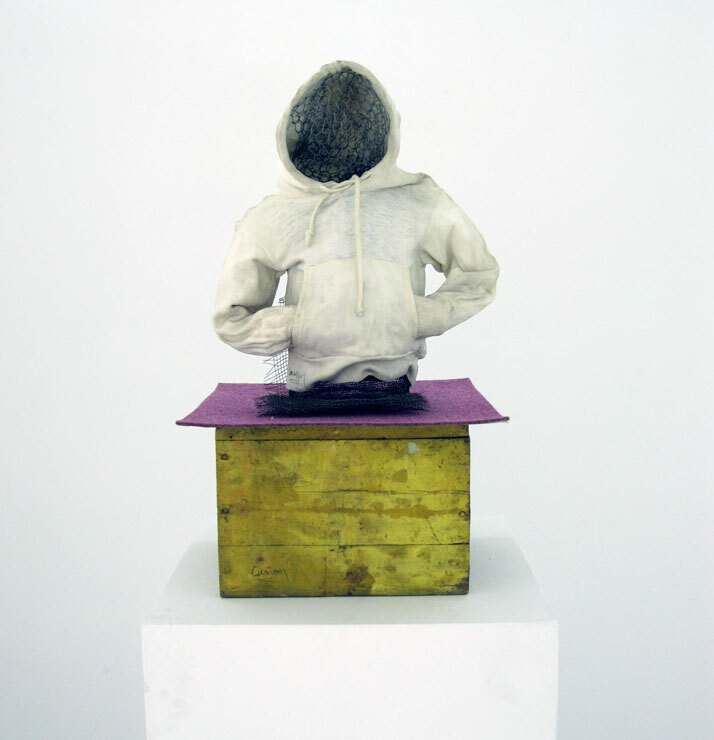 Vlassis Caniaris, Youngster, 1974, mixed media, 170x 55x70cm. Caniaris makes a striking political statement - he is already a member of the resistance organization "Democratic Defense," while he constitutes the most sophisticated artistic works in the Greek art scene. His generation, the generation of the 1960’s, whose internationalism is very different to the previous Hellenism of the 1930’s, has brilliant representatives like Chryssa, Takis, G. Kounellis, K. Xenakis, Paul L. Samaras, St. Antonakos, and P. Xagoraris. Among them, lonely and detached is Caniaris. An artist who had simultaneously Tsarouchis and Moralis as professors and Duchamp, Pollock or the Brotheraers and the fellow Tapies, Beuys, Spoerri, Rotella, Merz, Vostell, Arman, Richter, Hacker and many more. It is noteworthy to emphasize the specificity of a true artist who comes from the suburbs but is active and dynamic in cultural art centers such as Rome, Paris or Berlin, using 'native’ materials the “bad question” that the ancient Athenians charged the tragic poet Phrynichus. Furthermore, subsequent to World War II we lived numerous instances of a ‘concerted' leadership, which remained in sensationalism or the surface had little to do with activism of Boccioni, or a juvenile poetic Breton. In our country, and elsewhere, often the sophistication of a form was praised as a revolution, but was merely formalism. We also know how agonizing the market is when looking for a "new product” and how such a reality creates a kind of production history, which acts parallel to the official. 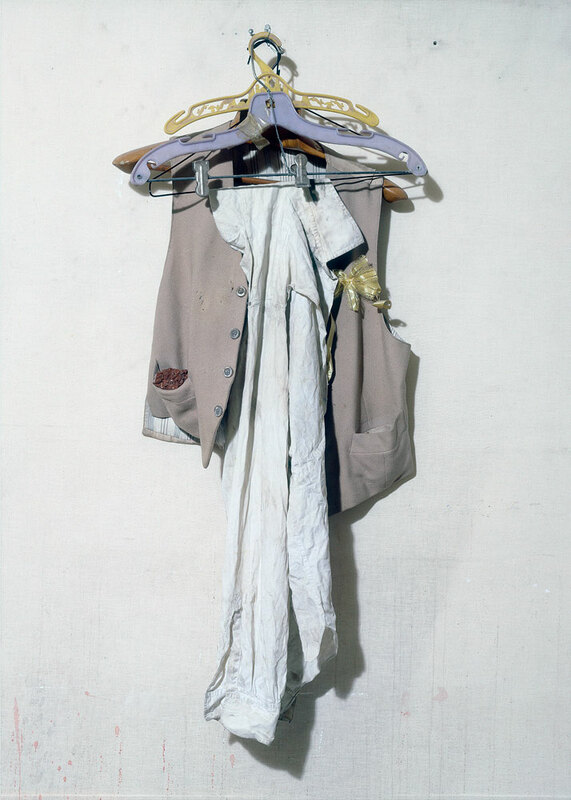 Vlassis Caniaris, Boudoir, 1974, mixed media, 320 x 550 x 300 cm. The real leader comes forward always in direct correspondence with the society that carries it. And this is the key area of achievement of Vlassis Caniaris, an artist who apposite’s the original codes of leadership to extend expressively while working primarily. He herein positions the undisputed bid, using transnational know-how to interpret indigenous experience, at that time-and locally-his identity. That is how his work is the interactive combination of international and national long before any ethnic guide. And it is this exact component that appends to the exploration of the nature of drama, but also led to the necessary clearance. Caniaris, in a timely manner shaped his personal idiom as he explored the current morphological characters so that to speak directly and original about his personal experience. From tachisme and the lyrical abstract of Marcinelle (1956-1959) to the "Walls" (1959), the repoussé, namely dramatized surfaces visually recorded the time of his generation. A sequence of tragic events, the story itself is what triggers the formation, but devoid of this formation being diverted to a figurative naiveness. Since then the subject of Pop or the cast of Arte Povera is developed - parallel to what happens to the rest of Europe or the U.S. at that time - strategy tools to visualize an entirely personal- experiential mythology. For this artist, Greece of hydrocephalus development and structural contradictions, of the pathetic dictatorship and the junta, the restoration of democracy, but also the rogue immigrants, from where the third world South is promoted to the advanced Northern Europe, transformed into evocative performances by theatrical mannequins of unique design intelligence, as it happened at the exhibition “Gastarbeiter -Fremdarbeiter ,” Berlin, 1974, “Hélas Hellas – The Painter and his Model” Multi-cultural space ‘Fix-Bernier’ 1980, in " Where is North and Where is South?” at the 1988 Venice Biennale, and in the group exhibition "About Homeland” in the House of Cyprus in 1996. Caniaris was armed with modern history, functioning in a critical and intrusive manner regarding the average taste undermining the current complacency. This is the case of an artist who has experienced groundbreaking expression and succès de scandale, but also a need to overcome, which resulted in a proposal for the body, which is not a single political or social subject, but an ontological, existential figure. The figure of loneliness or margin expressed through aesthetic media. I believe that the “Walls” of Caniaris are the precursors of graffiti and street-art. The mannequins in an ingenious manner join the artist’s articulated model of De Chirico and the figures of Seagal forming an existential proposal, "dilapidated" sculptures across large scale monuments of empty rhetoric and the extravaganza of propaganda. 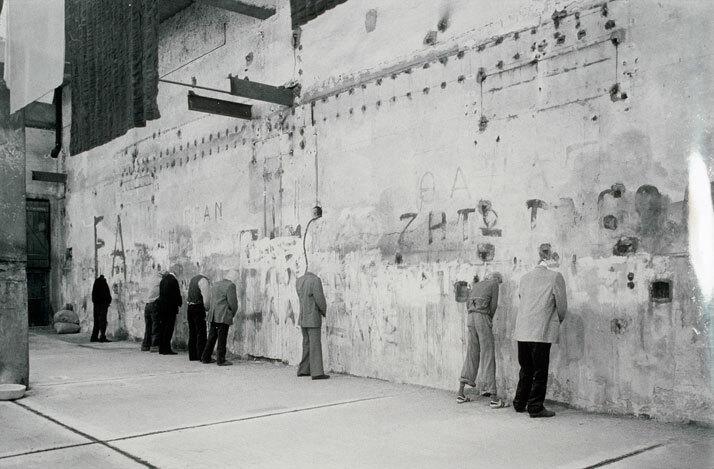 The "Urinal of History" 1979-1980 is addressed in political terms to the "Fountain" of Duchamp (1917) and is a leading postwar work of the Greek avant-garde. When Caniaris was speaking at a given moment in time, unsuspicious about the pan-European problem of immigration and the dimension of this problem (1970) for the unequal relations between Greece and Germany (1973), the class-toxic contrasting North-South (1988) was in numerous cases prophetic. However, above all Caniaris reports since 1980 the oversized populism (Hélas-Hellas Greece, alas) by paying to it the root of the upcoming crisis. As per this, he was one of the few in the whole of Greek intellectuals. Στη τÎ­χνη μ'ενδιαφÎ­ρει τÏσο το αισθητικÏ δημιοÏργημα Ïσο και η στÎ¬ση ζωÎ®ς του δημιουργοÏ του. O KανιÎ¬ρης υπÎ®ρξε Î­νας μοντÎ­ρνος καλλιτÎ­χνης, πολιτικοποιημÎ­νος αλλÎ¬ ποτÎ­ στρατευμÎ­νος, που Î­δρασε αδιατÎ¬ρακτα, εδÏ και εξÎ®ντα χρÏνια, απÏ τον Ïστερο μοντερνισμÏ ως τα κρÎ¬σπεδα του μεταμοντÎ­ρνου Î­χοντας ως αποκλειστικÏ μορφοπλαστικÏ του υλικÏ το Î¯διο το σÏμα της ιστορÎ¯ας και μÎ¬λιστα της νεÏτερης ελληνικÎ®ς ιστορÎ¯ας, απÏ τον εμφÏλιο του 1944-49 ως την δικτατορÎ¯α του 1967-74 και απÏ την αποκατÎ¬σταση της δημοκρατÎ¯ας ως σÎ®μερα. Το Î­ργο του, μονοειδÎ­ς αλλÎ¬ πολυÏμματο, σαν τον μυθικÏ εκεÎ¯νον Îργο, κατοπτεÏει το πολιτικοκοινωνικÏ γÎ¯γνεσθαι εντÏς και εκτÏς και παÎ¯ρνει θÎ­ση κατÎ¬ περÎ¯σταση. Δρα δηλαδÎ®, Ïπως δροÏσε ανÎ­καθεν η μεγÎ¬λη ΤÎ­χνη: παρηγορητικÎ¬, αλλÎ¬ και αποκαλυπτικÎ¬Î συγκινÏντας, αλλÎ¬ και ερμηνεÏοντας. H ιδιαιτερÏτητα της αισθητικÎ®ς του πρÏτασης Î­γκειται στις λεπτομÎ­ρειεςÎ στην υπÎ­ρβαση εκεÎ¯νη που μεταμορφÏνει το τυχαÎ¯ο αντικεÎ¯μενο σε μορφοπλαστικÎ® αξÎ¯α, που μεταγγÎ¯ζει στο ευτελÎ­ς ψÎ®γματα του πολÏτιμου, που ψιθυρÎ¯ζει την Ïποια προσωπικÎ® ιστορÎ¯α, το Ïποιο γÎ­λιο Î® λυγμÏ εις επÎ®κοον της αιωνιÏτητας. ΑπÏ τις πρÏτες informelles του συνθÎ­σεις το 1956-57 πÎ¬νω σε εφημερÎ¯δες Î® με dripping σε καμβÎ¬δες, ο ΚανιÎ¬ρης δεν περιÎ­γραφε, υπÎ­βαλε. Σε ηλικÎ¯α 30 χρονÏν το 1958 παρουσιÎ¬ζει την πρÏτη του ατομικÎ® Î­κθεση στην ΑθÎ®να (ΓκαλερÎ¯ «ZυγÏς»), η οποÎ¯α εÎ¯ναι ιστορικÎ¬ και η πρÏτη ατομικÎ® Î­κθεση αφηρημÎ­νης ζωγραφικÎ®ς που Î­γινε ποτÎ­ στην ΕλλÎ¬δα. Îλα τα Î­ργα Î®ταν αφιερωμÎ­να στους νεκροÏς ενÏς τρομακτικοÏ εργατικοÏ ατυχÎ®ματος που εÎ¯χε γÎ¯νει τÏτε στα ορυχεÎ¯α της Marcinelle στο ΒÎ­λγιο. Το οξÏμωρο εÎ¯ναι πως αυτÎ®ν την Î­κθεση χτÏπησε η καθαρÏαιμη μαρξιστικÎ® κριτικÎ® ως Î¬κρως υποκειμενικÎ® και φορμαλιστικÎ®, ενÏ την εξÎ®ραν «αστοÎ¯» τεχνοκριτικοÎ¯. Το 1959 στη ΝÎ¬πολη και την ΜπολÏνια και το 1960 σε ατομικÎ® Î­κθεση στη γκαλερÎ¯ «La Tartaruga» της ΡÏμης, ο ΚανιÎ¬ρης περνÎ¬ σταδιακÎ¬ απÏ το τελÎ¬ρο στο χÏρο και απÏ την εικÏνα στο αντικεÎ¯μενο. ΠερνÎ¬, δηλαδÎ®, απÏ τους «ΤοÎ¯χους», Î­ργα που αφιερÏνει στην ΑθÎ®να της ΑντÎ¯στασης και του ΕμφυλÎ¯ου, στις Î¬τιτλες συνθÎ­σεις, Ïπου το Î¯διο πια το υλικÏ απολογεÎ¯ται για τη φÏση και το περιεχÏμενÏ του. O μελετητÎ®ς του καλλιτÎ­χνη, Michael Fehr, σημειÏνει σχετικÎ¬: «ΚατÎ¬ τη δεκαετÎ¯α του εξÎ®ντα (ο ΚανιÎ¬ρης) επιδÏθηκε μ’ Î­ναν πολÏ προσωπικÏ τρÏπο στη διÎ¬λυση της κλασικÎ®ς Î­ννοιας του πÎ¯νακα και ανÎ­πτυξε τη δικÎ® του ιδιαÎ¯τερη γλÏσσα ως κατασκευαστÎ®ς αντικειμÎ­νων». ΠροσωπικÎ¬, θα πρÏσθετα και λυρικÏς χρÎ®στης των αντικειμÎ­νων αυτÏν. Σε μια κατασκευÎ® του ’61, που την ονομÎ¬ζει «ΧÏρος μÎ­σα στο ΧÏρο», πÎ¬νω σε μια γÏψινη ανÎ¬γλυφη επιφÎ¬νεια, ο ΚανιÎ¬ρης χαρÎ¬ζει κÎ¬θετες μπλε και Î¬σπρες γραμμÎ­ς που παραπÎ­μπουν στην ελληνικÎ® σημαÎ¯α και μετÎ¬ επιθÎ­τει Î­να μαÏρο τετρÎ¬γωνο σαν να διαγρÎ¬φει την προσπÎ¬θεια. Οι αντÎ¯στοιχες «ΣημαÎ¯ες» του Jasper Johns φιλοτεχνοÏνται Î®δη απÏ το 1955. ΜÏνο που στην προκειμÎ­νη περÎ¯πτωση το ιδεολογικÏ-συγκρουσιακÏ στοιχεÎ¯ο και η συναισθηματικÎ® φÏρτιση εÎ¯ναι πιο Î­ντονες. O ΚανιÎ¬ρης εν προκειμÎ­νω πολιτικοποιεÎ¯ Î­τι περαιτÎ­ρω την πασÎ¯γνωστη φρÎ¬ση του ΣεφÎ­ρη «Îπου κι αν πÎ¬ω η ΕλλÎ¬δα με πληγÏνει». Κι Ïλα αυτÎ¬ σταθερÎ¬ εντÏς της ευρÏτερης Î­ρευνας που διεξÎ®γε η ευρωπαÏκÎ® avant-garde απÏ το ΛονδÎ¯νο ως τη ΡÏμη και απÏ το ΠαρÎ¯σι ως το ΒερολÎ¯νο προσπαθÏντας να διατυπÏσει το δικÏ της λÏγο απÎ­ναντι στην αμερικανικÎ® μοντερνιστικÎ® προÎ­λαση: Nouveau Réalisme, L’ Art Autre, Arte Povera, Art and Language εÎ¯ναι οι αντιρρητικÎ­ς προτÎ¬σεις απÎ­ναντι στις εκδοχÎ­ς της Pop Î® της Conceptual Art που Î­ρχονται απÏ την Î¬λλη πλευρÎ¬ του ΑτλαντικοÏ. Tο 1964 εÎ¯ναι μια σημαδιακÎ® χρονιÎ¬: καταπλÎ­ει στη Biennale BενετÎ¯ας σαν θωρηκτÏ, εκπροσωπÏντας τις HΠA, ο Robert Rauschenberg και υποστηρÎ¯ζεται απÏ στρατιÎ¬ τεχνοκριτικÏν. Tο A’ βραβεÎ¯ο της διοργÎ¬νωσης υπÎ®ρξε λογικÏ επακÏλουθο. Ως πρÎ¬ξη αντιπερισπασμοÏ ο ανεξÎ¬ρτητος κριτικÏς και οργανωτÎ®ς εκθÎ­σεων Pierre Restany παρουσιÎ¬ζει στο ιστορικÏ θÎ­ατρο La Fenice της BενετÎ¯ας, τον ΙοÏλιο της Î¯διας χρονιÎ¬ς, την αντι-Î­κθεση «ΠροτÎ¬σεις για μια νÎ­α ελληνικÎ® γλυπτικÎ®» με συμμετÎ­χοντες το ΔανιÎ®λ, τον KανιÎ¬ρη και τον KεσσανλÎ®. ΧαρτÏκουτα, σεντÏνια, σκÎ¬λες Î® ροÏχα μÎ­σα σε συρμÎ¬τινους σκελετοÏς αποτελοÏν τα «Î­ργα», το αποτÎ­λεσμÎ¬ τους Ïμως, θεατρικÏτατο, Ïσο και χιουμοριστικÎ¬ ανατρεπτικÏ, εγγρÎ¬φεται Î­κτοτε δυσανÎ¬λογα σοβαρÏ. ΣταδιακÎ¬, ο καλλιτÎ­χνης συγκροτεÎ¯ μιαν ανθρÏπινη μορφÎ®, προλαβαÎ¯νοντας τον Γ. XειμωνÎ¬ Ïταν λÎ­ει στον «ΕχθρÏ του ποιητÎ®» Ïτι η μορφÎ® του ανθρÏπου δεν υπÎ¬ρχει στη φÏση αλλÎ¬ την επινÏησε η ζωγραφικÎ®. ΕπÏμενος μεγÎ¬λος σταθμÏς η Î­κθεση του 1969 στη «NÎ­α ΓκαλερÎ¯» της AθÎ®νας, ενÏ η δικτατορÎ¯α μαÎ¯νεται στην EλλÎ¬δα, και η μεταφορÎ¬ της στο Musée d’Art Moderne de la Ville de Paris το 1970. Îργα του 1964, θαρρεÎ¯ς προφητικÎ¬, εμπλÎ­κουν τους γÏψους με τις στρατιωτικÎ­ς ζÏνες, τα συρματοπλÎ­γματα με τα γαρÎ¯φαλα και τα Î¯χνη των πελμÎ¬των με τους μολυβÎ­νιους στρατιÏτες. O KανιÎ¬ρης πραγματοποιεÎ¯ μια συνταρακτικÎ® πολιτικÎ® δÎ®λωση –εÎ¯ναι Î®δη μÎ­λος της αντιστασιακÎ®ς οργÎ¬νωσης «ΔημοκρατικÎ® Îμυνα», ενÏ παρÎ¬λληλα συγκροτεÎ¯ την πιο προωθημÎ­νη καλλιτεχνικÎ¬ ενÏτητα Î­ργων στον ελληνικÏ χÏρο. Η γενιÎ¬ του, η γενιÎ¬ του ’60, της οποÎ¯ας ο διεθνισμÏς διαφοροποιεÎ¯ται Î­ντονα προς τον ελληνοκεντρισμÏ της προηγοÏμενης, της γενιÎ¬ς του ’30, Î­χει εκπροσÏπους λαμπροÏς, Ïπως η XρÏσα, ο TÎ¬κις, ο Γ. KουνÎ­λλης, ο K. ΞενÎ¬κης, ο ΠαÏλος, ο Λ. ΣαμαρÎ¬ς, ο Στ. AντωνÎ¬κος, ο Π. ΞαγορÎ¬ρης. AνÎ¬μεσÎ¬ τους, μοναχικÏς και ξεχωριστÏς, ο KανιÎ¬ρης. Îνας δημιουργÏς που εÎ¯χε ταυτοχρÏνως δασκÎ¬λους τον TσαροÏχη, τον MÏραλη αλλÎ¬ και τον Duchamp, τον Pollock Î® τον Brotheraers και συνοδοιπÏρους τον Tapies, τον Beuys, τον Spoerri, τον Rotella, τον Merz, τον Vostell, τον Arman, τον Richter, τον Hacker κ.Î¬.. EδÏ πρÎ­πει να υπογραμμιστεÎ¯ η ιδιαιτερÏτητα ενÏς καλλιτÎ­χνη που προÎ­ρχεται μεν απÏ την περιφÎ­ρεια αλλÎ¬ που ενεργοποιεÎ¯ται σε καλλιτεχνικÎ¬ κÎ­ντρα, Ïπως η PÏμη, το ΠαρÎ¯σι Î® το BερολÎ¯νο, χρησιμοποιÏντας ως υλικÎ¬ «ιθαγενÎ®» στοιχεÎ¯α, τα «οικεÎ¯α κακÎ¬» που καταλÏγισαν οι αρχαÎ¯οι ΑθηναÎ¯οι στον τραγωδÏ ΦρÏνιχο. ΠαρÎ¬λληλα, μετÎ¬ τον B’ ΠαγκÏσμιο ΠÏλεμο ζÎ®σαμε πÎ¬μπολλες περιπτÏσεις μιας «συμπεφωνημÎ­νης» πρωτοπορÎ¯ας, η οποÎ¯α, παραμÎ­νοντας στον εντυπωσιασμÏ Î® την επιφÎ¬νεια, εÎ¯χε ελÎ¬χιστες σχÎ­σεις με τον ακτιβισμÏ ενÏς Boccioni, Î® την ποιητικÎ® παραβατικÏτητα ενÏς Breton. Στον τÏπο μας, αλλÎ¬ και αλλοÏ, συχνÎ¬ η εκζÎ®τηση μιας φÏρμας εγκωμιÎ¬στηκε ως επανÎ¬σταση, ενÏ απλÏς Î®ταν φορμαλισμÏς. ΓνωρÎ¯ζουμε επÎ¯σης, πÏσο εναγÏνια αναζητεÎ¯ η αγορÎ¬ το «καινοÏριο προÏÏν» και πÏσο μια τÎ­τοια πραγματικÏτητα δημιουργεÎ¯ Î­να εÎ¯δος παρα-ιστορÎ¯ας που δρα παρÎ¬λληλα προς την επÎ¯σημη. H αληθινÎ® Ïμως, πρωτοπορÎ¯α προκÏπτει πÎ¬ντα σε Î¬μεση αντιστοÎ¯χηση προς την κοινωνÎ¯α η οποÎ¯α την κυοφορεÎ¯. Kι αυτÏς εÎ¯ναι ο ουσιαστικÏς χÏρος δρÎ¬σης του Bλ. KανιÎ¬ρη, ενÏς καλλιτÎ­χνη που οικειοποιεÎ¯ται τους αυθεντικοÏς κÏδικες της πρωτοπορÎ¯ας για να τους επεκτεÎ¯νει εκφραστικÎ¬ λειτουργÏντας πρωτογενÏς. O Î¯διος, και εδÏ Î­γκειται η αδιαμφισβÎ®τητη προσφορÎ¬ του, χρησιμοποιεÎ¯ τη διεθνικÎ® του θητεÎ¯α για να ερμηνεÏει το εντÏπιο βÎ¯ωμα, τη δεδομÎ­νη –χρονικÎ¬ και τοπικÎ¬– ταυτÏτητÎ¬ του. Îτσι το Î­ργο του αποτελεÎ¯ το διαλεκτικÏ συνδυασμÏ του διεθνοÏς και του εθνικοÏ πολÏ πιο πριν απÏ τον οποιονδÎ®ποτε ethnic συρμÏ. Και εÎ¯ναι αυτÏ ακριβÏς το στοιχεÎ¯ο που προσδÎ¯δει στην Î­ρευνÎ¬ του το χαρακτÎ®ρα του δρÎ¬ματος, αλλÎ¬ και οδηγεÎ¯ται στην αναγκαÎ¯α κÎ¬θαρση. O KανιÎ¬ρης διαμÏρφωσε εγκαÎ¯ρως το προσωπικÏ του ιδÎ¯ωμα διευρÏνοντας τους ισχÏοντες μορφοπλαστικοÏς χαρακτÎ®ρες Ïστε να εκφραστεÎ¯ πρωτÏτυπα και Î¬μεσα το ατομικÏ του βÎ¯ωμα. ΑπÏ το tachisme και τη λυρικÎ® αφαÎ¯ρεση της Marcinelle (1956-59) ως τους «TοÎ¯χους» (1959), τις ανÎ¬γλυφες δηλαδÎ® δραματοποιημÎ­νες επιφÎ¬νειες στις οποÎ¯ες καταγρÎ¬φεται εικαστικÎ¬ το χρονικÏ της γενιÎ¬ς του. Mια σειρÎ¬ τραγικÏν γεγονÏτων, η ιστορÎ¯α η Î¯δια, εÎ¯ναι αυτÎ® που πυροδοτεÎ¯ τη δημιουργÎ¯α του, χωρÎ¯ς Ïμως η δημιουργÎ¯α αυτÎ® να εκτρÎ­πεται σε αναπαραστατικÎ­ς αφÎ­λειες. Îκτοτε το αντικεÎ¯μενο της Pop Î® το απÏρριμμα της Arte Povera καθÎ¯στανται –παρÎ¬λληλα με Ï, τι συμβαÎ¯νει και στην υπÏλοιπη EυρÏπη Î® τις HΠA την εποχÎ® εκεÎ¯νη– στρατηγικÎ® εργαλεÎ¯α για να οπτικοποιÎ®σει μιαν απολÏτως προσωπικÎ®-βιωματικÎ® μυθολογÎ¯α.Για τον καλλιτÎ­χνη αυτÏν η EλλÎ¬δα της υδροκÎ­φαλης ανÎ¬πτυξης και των δομικÏν αντιφÎ¬σεων, της γελοÎ¯ας δικτατορÎ¯ας και της μεταπολÎ¯τευσης, αλλÎ¬ και οι μετανÎ¬στες-παρÎ¯ες, που απÏ τον τριτοκοσμικÏ NÏτο προωθοÏνται αγεληδÏν στον προηγμÎ­νο ευρωπαÏκÏ BορρÎ¬, μετατρÎ­πονται σε υποβλητικÎ¬ δρÏμενα, με θεατρικÏτητα μανεκÎ¯να μοναδικÎ®ς σχεδιαστικÎ®ς οξÏτητας, Ïπως συνÎ­βη στην Î­κθεση «Gastarbeiter-Fremdarbeiter», BερολÎ¯νο, 1974, στο «Hélas Hellas - O ZωγρÎ¬φος και το MοντÎ­λο του», TεχνοχÏρος «Φιξ-Bernier» 1980, στο «ΠοÏ ο ΒορρÎ¬ς και ΠοÏ ο ΝÏτος;» στη Biennale ΒενετÎ¯ας το 1988 Î® στην ομαδικÎ® Î­κθεση «ΠερÎ¯ ΠÎ¬τρης» στο «ΣπÎ¯τι της ΚÏπρου» το 1996. O KανιÎ¬ρης, με Ïπλο τη σÏγχρονη ιστορÎ¯α, λειτουργεÎ¯ κριτικÎ¬ και παρεμβατικÎ¬ ως προς το μÎ­σο γοÏστο υπονομεÏοντας τον ισχÏοντα εφησυχασμÏ. ÎÎχουμε δηλαδÎ® την περÎ¯πτωση ενÏς δημιουργοÏ που βÎ¯ωσε την πρωτοποριακÎ® Î­κφραση και ως succès de scandale, αλλÎ¬ και ως ανÎ¬γκη για υπÎ­ρβαση και που κατÎ­ληξε σε μια πρÏταση σÏματος, το οποÎ¯ο δε συνιστÎ¬ μÏνο πολιτικÏ Î® κοινωνικÏ υποκεÎ¯μενο, αλλÎ¬ οντολογικÎ®, υπαρξιακÎ® φιγοÏρα. Tη φιγοÏρα της μοναξιÎ¬ς Î® του περιθωρÎ¯ου διατυπωμÎ­νη με μÎ­σα αισθητικÎ¬. Οι “τοÎ¯χοι” του ΚανιÎ¬ρη αποτελοÏν πιστεÏω τους προδρÏμους του γκρÎ¬φιτι και της street-art. Τα μανεκÎ¯να του ενÏνουν ιδιοφυÏς τα ανδρεÎ¯κελα του De Chirico και τις φιγοÏρες του Seagal αποτελÏντας πρÏταση υπαρξιακÎ®ς, “φτωχικÎ®ς” γλυπτικÎ®ς απÎ­ναντι στα μεγαλÏσχημα μνημεÎ¯α της κενÎ®ς ρητορεÎ¯ας και της φαντασμαγορικÎ®ς προπαγÎ¬νδας. Το “ΟυρητÎ®ριο της ΙστορÎ¯ας” του απÏ το 79-80 απευθÏνεται με Ïρους πολιτικοÏς στο ¨”ΟυρητÎ®ριο” του Duchamp του 1917 και αποτελεÎ¯ τι κορυφαÎ¯ο μεταπολεμικÏ Î­ργο της ΕλληνικÎ®ς avant-garde. Ο ΚανιÎ¬ρης μιλÏντας σε χρÏνο ανÏποπτο για τους μετανÎ¬στες και την πανευρωπαÏκÎ® διÎ¬σταση του προβλÎ®ματος (1970), για τις Î¬νισες σχÎ­σεις ΕλλÎ¬δας-ΓερμανÎ¯ας (1973), για την ταξικÎ®-τοξικÎ® αντÎ¯θεση ΒορρÎ¬-ΝÏτου (1988) υπÎ®ρξε πολλαπλÎ¬ προφητικÏς. ΠερισσÏτερο Ïμως απ' Ïλα ο ΚανιÎ¬ρης, απÏ το 80 ακÏμη, καταγγÎ­λλει τον γιγαντοÏμενο λαÏκισμÏ (Hélas -Hellas ΕλλÎ¬δα-ΑλÎ¯μονο) αποδÎ¯δοντας σε αυτÏν τη βασικÎ® αιτÎ¯α της επερχÏμενης κρÎ¯σης. Ως προς αυτÏ υπÎ®ρξε Î­νας απÏ τους ελÎ¬χιστους μÎ­σα στο σÏνολο της ελληνικÎ®ς διανÏησης.